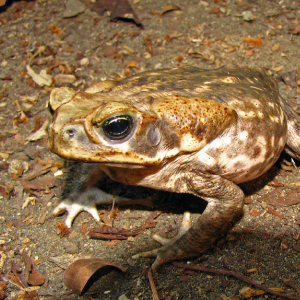 A very large toad with a broad U-shaped furrow between the eyes. The skin is rough and warty. The marine toad is unusual from other members of the Bufonidae family in that it is known to eat stationary objects whereas most members of this family locate prey by movement. Marine toads have the distinction of being one othe only known amphibians to eat plant matter and carrion as adults. The majority of amphibian species are dependant upon live prey as food. The toxicity of the poison from the marine toad can be lethal to small and medium-sized animals; it also can have negative effects on species as large as dogs. The poison acts strictly as a defensive adaptation. Photo by Joe McKenna (https://www.flickr.com/photos/jpmckenna/3288512367). Photo has been cropped.